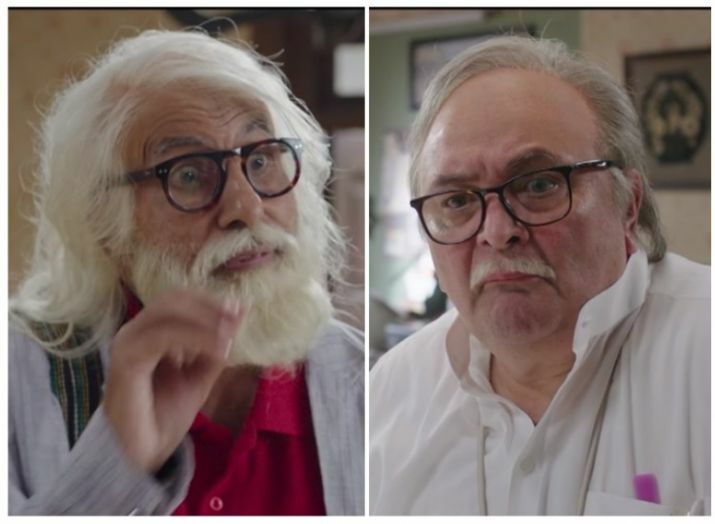 Two of Bollywood's greatest stars, Amitabh Bachchan and Rishi Kapoor, will share a screen together for the first time in almost three decades when comedy "102 Not Out" is released Friday. The movie, directed by Umesh Shukla, sees Bachchan play a 102-year-old who dreams of becomming the world's longest-living man by making it to 118. But to do so, he decides he has to put his downbeat 75-year-old son, played by Kapoor (who is 65 in reality), into an old people's home. The two actors -- who were the stars of a string of hits throughout the 1970s and '80s -- last paired up for a film in 1991. "Getting together after a gap of 27 years with Rishi ji, was just like getting off a bicycle and getting on it again," Bachchan, 75, told the Press Trust of India news agency this week. The cinema icon affectionately known as "Big B" shot to stardom in the early 1970s on the back of powerful roles in hits "Zanjeer" and "Sholay". He was dubbed India's "angry young man" for portraying violent heroes fighting an unjust system and injecting a new aggressive element into Bollywood movies, which had previously consisted of polite romances. Kapoor, part of India's legendary Kapoor acting family, made a name for himself as a romantic hero following his breakthrough role in the 1973 classic "Bobby". Bachchan and Kapoor's first film together was the 1976 romantic drama "Kabhi Kabhie" ("Sometimes"). "Amar Akbar Anthony" followed in 1977, "Naseeb" in 1981, "Coolie" in 1983 and "Ajooba" ("Prodigy") in 1991. "You played my step father-in-law in 'Kabhi Kabhie', we were brothers in 'Amar Akbar Anthony' and 'Naseeb'. We were friends in 'Coolie' and ... in 'Ajooba'," Kapoor, 65, said to Bachchan at a promotional event attended by AFP. Lately the two have enjoyed success playing cantankerous old men, notably Bachchan's turn in "Piku" (2015) and Kapoor's role as a 90-year-old in "Kapoor & Sons" (2016). "102 Not Out" is an adaptation of a popular Gujarati play by Saumya Joshi.